Yash and I started next to 48 other riders. This was my first time at SLR. I didn’t know what to expect other than hold on for the climbs. Soliciting other’s advice and experiences, there would be break attempts but it would most likely come down to a group duking it out on the final climb. Because of this, Yash and I planned to sit in to conserve as much energy as possible for the 8-minute climb. My goal was to get near the front for the start of the climb and sag back as needed. For the first couple laps, riders tried getting up the road. The crosswinds lowered their morale after a couple minutes and they were reeled back. The major moment in the race came on the third lap’s climb. The pace was hot leading into it, about half way up an attack was made. This splintered the pack into smaller groups of 6-10 riders, with gaps of 10-15 seconds in between each. Yash and I found ourselves in the 3rd group. We bridged to the second group after gaining some composure after the downhill. There was a lull in the race as teams were blocking for their teammates up the road. It became apparent we were racing for a top 10 spot at this point. Coming into the final climb I was positioned 6th. Not even a minute into it, my right leg starts twinging and lightly cramping. Keep riding…… BOOM, hammy and quad lock up. I unclip my right leg to shake it off. Too late. In the end I’d lose another 2 minutes while I mastered yoga in the dirt. I limped up the final hill to a 25th or so finish. Overall, I was pleased to be in that position at the end of a tough race that didn’t suit my strengths. BIG THANK YOU to Sergei Vasilyev, Mike Allec and Tony Rago for helping with the feed zone. I would of been off the bike on the 3rd lap if it weren’t for you guys. 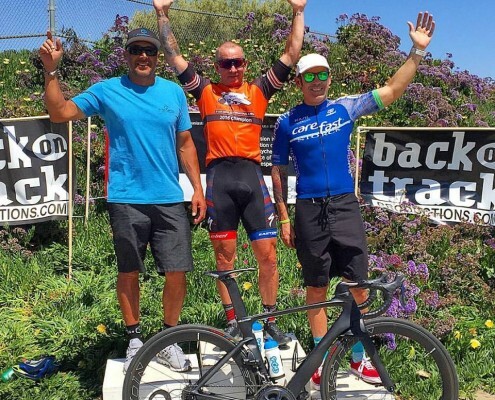 Tony and I lined up with 30+ guys, including all of the top old guy climbers in SoCal for a 73 mile road race, 5 laps with a 8-9 min climb at the end of each lap. Our race plan was pretty simple, don’t do any work in the race. We were willing to bridge to a break or go with a promising break, but we were not going to do any work reeling in breaks. We knew the race would most likely come down to the final climb and we would need to conserve energy to be able to hang on. The race officials asked us to roll out semi neutral until the first s curve, about a mile down the hill, but 3 big guys ignored that and attacked after 100m. As we got to the first climb we caught 2 guys, as I expected, but the other guy was still putting time on the group. After the second lap the solo rider had put 2 minutes on the group so some of the race favorites were getting anxious and started to try and get guys working to pull him back. I sat near the front, but refused to do any work, which got a few guys fired up, especially the race favorite, but we stuck to the plan. After 3 laps I started having some leg cramping issues, i think caused by the heat and from not using any hydration pre load. 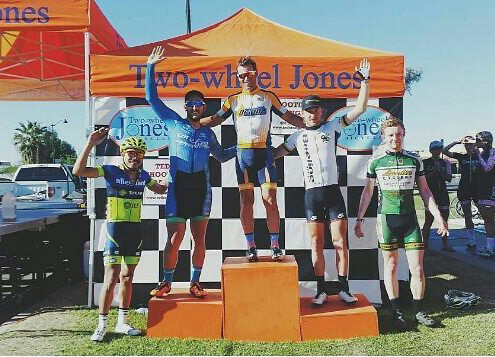 I was able to fight off full on cramps and was in pretty good position thru the final lap. A couple of guys attacked a few miles before the final climb so I jumped on the race favorites wheel as he worked to reel them in. Tony came around and put a great final effort to get us about halfway to the break just as we hit the final climb. I continued to follow the wheel, but just as the climb kicked up I popped and my legs were done. I got separated from the group, rolled in for 13th, Tony a little behind me for 15th. The solo guy stayed away, won by 4 minutes. I lined up with a field of just under 50 riders for 103 miles of fun in the heat and wind on a grueling course. 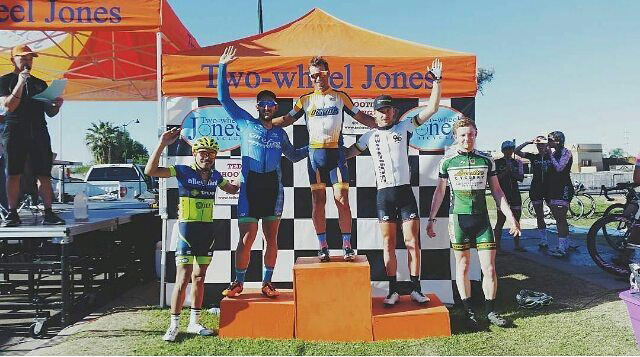 My plan was to just follow wheels, don’t put myself into the wind, and try to position myself near the front of climb each lap. Pretty much the same plan as 90% of the field I’m sure. Before the downhill begins about 6 riders go off the front and by the end of the first lap they have a small, but decent gap. The first climb wasn’t too bad as everyone was feeling each other out. The second time up the climb was brutal and it took me and several others chasing for almost half a lap to catch back on. The third climb started fairly mellow and then we were neutralized so the break in the 35+ could pass. The rest of the climb was fairly easy and guys started fetching bottles from the feed zone so they weren’t hitting it as hard near the top. The whole time this is going on there are a few attacks each lap to bridge up to the break which by now was only a couple riders. The wind had kicked up by now and no bridge attempt was successful. The fourth climb was a little tougher but I managed to latch back on right after the turn around. The descent was very mellow and I was even talking to Tate from Allegiant on most of it. As soon as we hit the bottom and made the left turn a couple teams started putting in the chase to reel in the break which was holding steady at two minutes. The rest of the lap was strung out all the way back to the climb. A lot of guys were hurting by now. I made it up the climb until just after the S turn and then a couple surges did me in along with a lot of other riders. The rest of the race I never saw more than 6 or 8 riders together. The race had imploded. I tried to mount a chase with two other riders, but we lost one quickly and it was starting to feel like I was pedaling while wearing a pair of wet pants. 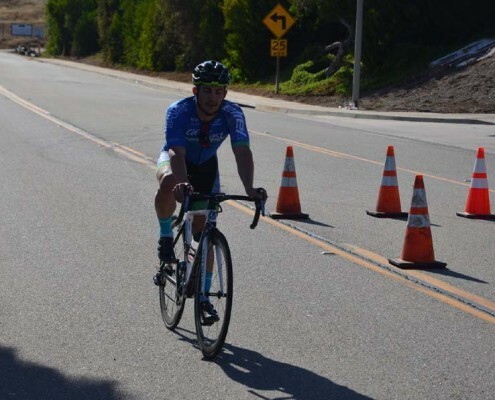 A SoCalCycling.com rider put in a decent chase and I would provide help occasionally. On the sixth climb he dropped me. I passed a few more riders up the climb and watched a few more call it a day. I was hurting but why not just finish? ; which is what I did. No idea where I finished, but well down in the 20’s or 30’s if I had to guess. A tough day of racing, but I think it is a very fair course and I will probably do the race again. Mike and I line up in a field of 53 on a hot and breezey day. The out and back course is 4 miles a lap — we were doing 6 laps. 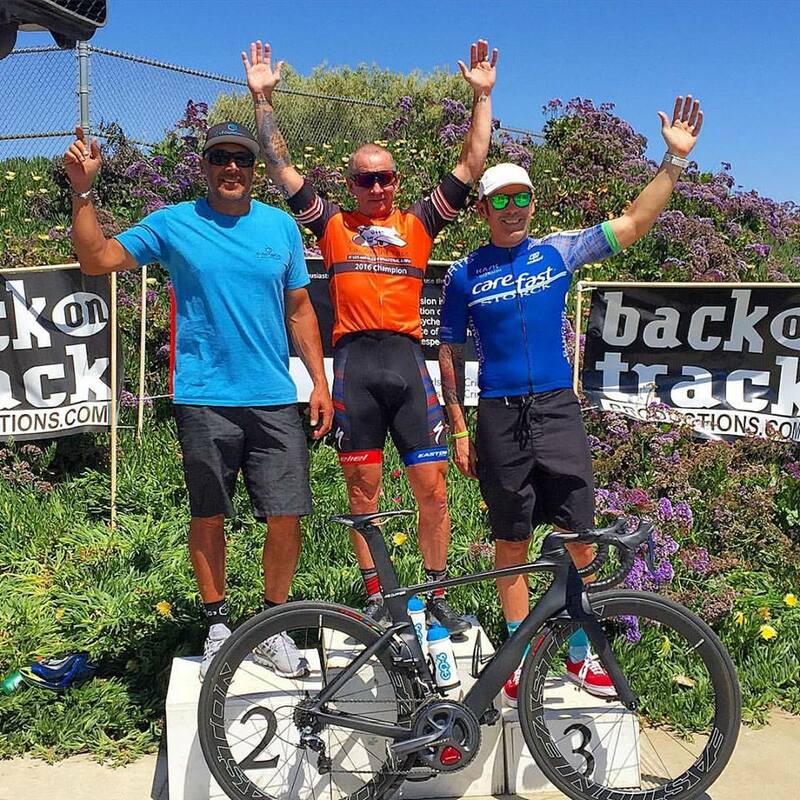 All the big So Cal teams were in the mix — I knew if it came down to a sprint Bart was one to be close to so I kept an eye on him and his Surf City boys. First lap starts kinda hot and there are moves being made pretty much immediately, we make the turn around and there was a decent head wind on this side of the course. No one wanted to be in the front for too long so Mike and I were just following wheels and maintaining top 10 or so in the field. I ended up in the front a couple times just from being in the rotation and refused to close any gaps — it was so early and there was really no reason — no one was staying away today. 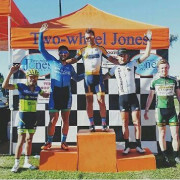 I was on Mikes wheel for a solid lap or so but it really wasnt organized at all and didnt want to end up back up front so I slid back and got behind the biggest bodies I could for the headwind portion of the laps. 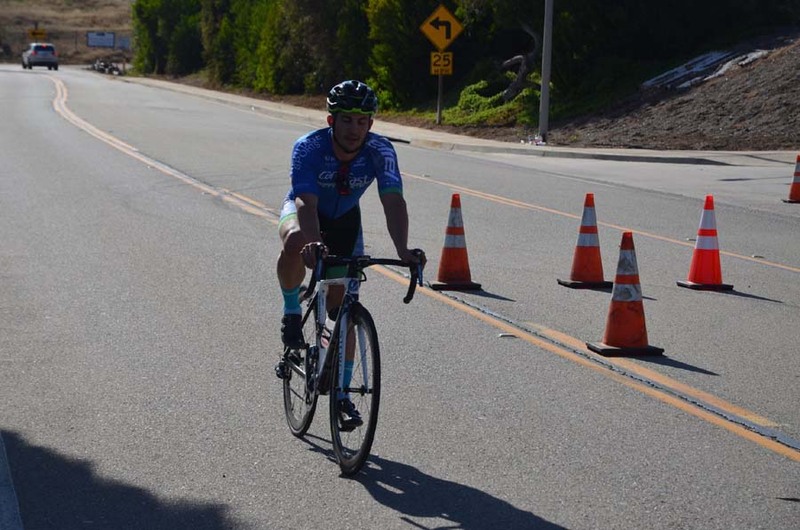 Final lap, I start moving up to top 10 wheels or so headed into the turnaround, I knew the sprint was going to be a long one so I wanted to be clear and stay on the outside — I chose the left side because of all the cones on the right. Sitting 8th wheel or so it heats up and guys start jumpin, SOOOO EARLY UGH. No choice time to go – freelanced my way thru everyone so I could to get a clear shot at the line and just kept diggin. I came around a final guy at the line and did a big bike throw to seal 3rd. 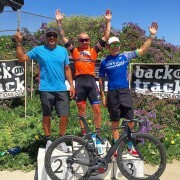 Nice cap to a great weekend of So Cal racing – weekend was just a blast. Seeing all our boys representing at SLR and LA was just awesome. Way to go everyone — great representation all weekend! I’m not ready for this temperature. It was hot. L-shaped course with a hard u-turn for the first corner and a long, long sprint. I’m guessing 300m from the corner. Anyways, it was Pro12, but 2s were scored separately. It made it interesting, to say the least. The 2s had different colored numbers and that made it a bit easier. For the first few laps it was hard, but that’s because I haven’t been riding that much lately. I tried to get in a few early moves, but after a few failed attempts, I decided to simply mark other 2s and only react if they got into something. A move with 1s would have been a free ride to the line. A break gets up the road, all 1s and the 3 major teams represented, and then come all the little counters and chasing and whatnot. I’m still just marking 2s and letting the 1s do whatever they’re gonna do. Lap after lap after lap. Bell lap arrives and out of the first turn, a 2 attacks. 1s stay kinda chasing, but I attack approaching turn 2 and I’m closing. Doesn’t look like I’m being followed at this point. Go through turn 3 and… drop my chain and one of my shoes unclip. WHAT THE I CAN’T EVEN. I’M GOING TO CRASH ARGHHHHHH. Somehow get my foot back into the pedal and chain back on before turn 4 and get back into the strung out field around 4th wheel with the one cat 2 still ahead. Everyone starts sprinting out of the last corner. OMG IT’S SO FAR. I give it a go and kick to stay on. Then I kick again and get around a 2. Closing, closing, and I get the one guy that was ahead a few meters before the line. Couldn’t close the other 2, though.